CLSS Scheme time duration has extended by the Ministry of Housing & Urban Affairs on dated 31st December 2018. Credit Linked Subsidy scheme provides the subsidy up to Rs. 2, 50,000/- under Pradhan Mantri Awas Yojana (URBAN)-Housing for All. The first time homebuyers may avail the benefits of CLSS Home Loans Scheme till 31st March 2020. The Economic Weaker sections(EWS) Middle-income group (MIG) whose income are among 6 lakh rupee to 18 lakh rupees per annum may apply for this interest subsidy scheme. It was announced by PM Narendra Modi on June 2015 and it was only for one year. The response of CLSS Scheme was good and 3.39 lakh beneficiaries have availed scheme benefits till 30th December 2018 so government has decided to officially increase the time duration of the CLSS Scheme till 31st March 2018. The CLSS Home Loans Scheme entails the subsidy Rs 2.5 lakh approximately through various banks and housing finance companies for EWS, LIG and MIG homebuyers who first time are buying the homes. The scheme is for Economic weaker section (EWS), Low-income Group (LIG) and for Middle Income Group. Credit subsidy of Rs. 2.5 Lakh would be provided on home loans. Subsidy is provided on purchase/construction/extension/improvement of house. CLSS Scheme works as an interest subsidy scheme. Directly 2.5 lakh rupees are not given to the beneficiary under the CLSS interest subsidy rather it will be adjusted in their home loan amount. Sections whose income is among Rs. 6 lakh to 12 lakh they will get 4 per cent subsidy on interest and whose income between 12 Lakh to 18 lakh will get 3 per cent interest subsidy. Beneficiaries can get around Rs. 2.5 Lakh upfront subsidy under Credit Linked Subsidy Home Loans Scheme. Interest Subsidy upto 6.50% p.a. 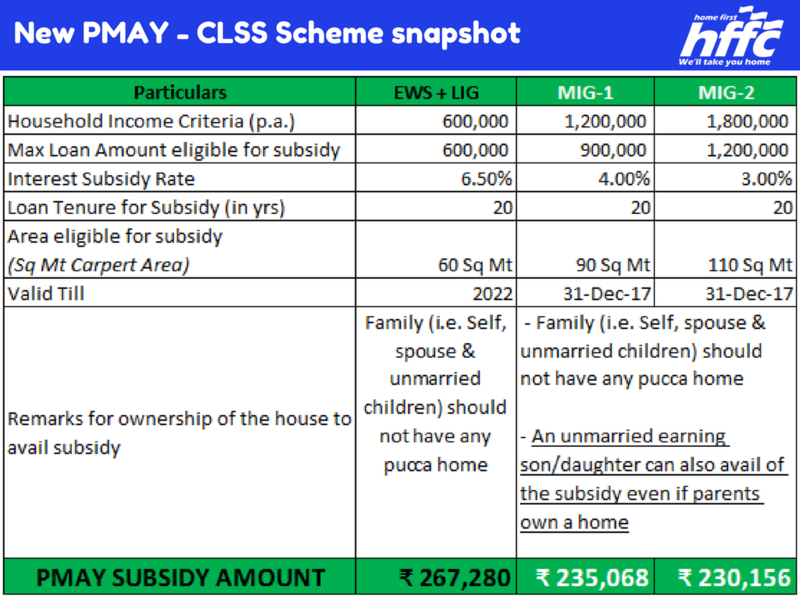 How to Apply for CLSS Interest Subsidy Scheme? Economical Weaker Section (EWS)/Lower Income Group (LIG)/Middle Income Group (MIG) may apply under CLSS subsidy to purchase/construction/extension/improvement of the house at the nearest banks and housing loan finance company. To get more detail about CLSS Home Loans Scheme application process contact to the home loan finance bank or company.